Americans are on the job more than workers in many countries are. According to a 2013 study by the International Labor Organization, 85.8 percent of American men and 66.5 percent of American women work more than 40 hours per week. We work 137 more hours per year than Japanese workers, 260 more hours per year than British workers and 499 more hours per year than French workers. When you combine all that work time with our culture's increasing dependence on electronics for entertainment, you can easily see why many Americans are overweight and out of shape. In fact, according to the U.S. Department of Health and Human Services, nearly 60 percent of employees do not get adequate exercise. As a result, workplace wellness programs are more important than ever. 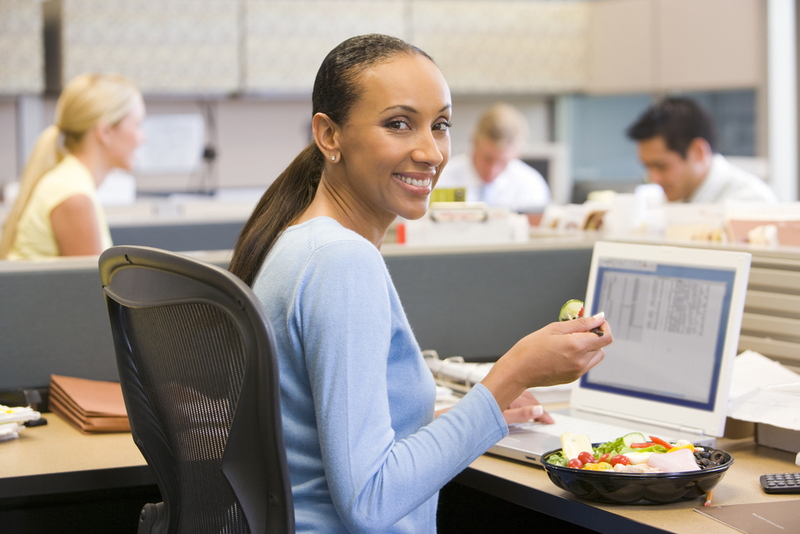 So what exactly is workplace wellness and how can it benefit your company? An article in the December 2010 issue of the Harvard Business Review defines workplace wellness as an organized program that a company initiates for their employees -- and sometimes their employees' family members -- to help reduce health risks, to enhance personal effectiveness, to improve quality of life and to benefit the organization's bottom line. There are many different types of corporate wellness programs with the best being the ones that educate and encourage employees to adopt a healthier lifestyle. There are five main benefits of establishing a culture of fitness in your company. It's a fact: healthy employees cost less than unhealthy employees. Recent studies by the University of Michigan, for instance, show that employers who emphasize fitness can save an average of: $1,100 a year for every employee who stops smoking, $1,200 a year on employees who lower their cholesterol levels from 240 mg to 190 mg and $177 a year for each worker who sheds enough pounds to move from obesity (more than 30 pounds overweight) to a healthy weight. Healthcare industry experts estimate that between 70 to 90 percent of healthcare spending is caused by problems associated with unhealthy lifestyle choices that can lead to chronic diseases. These lifestyle choices -- whether they are improper nutrition, too little exercise or smoking - cost American businesses more than one trillion dollars in lost productivity each year. It makes sense that healthier workers miss fewer days of work. For example, within six years after creating an employee health and well-being department, the MD Anderson Cancer Center in Houston, reported that lost work days had declined by 80 percent and modified-duty days by 64 percent. When calculated by multiplying the reduction in lost work days by average pay rates the Center's cost savings totaled $1.5 million. Workplace wellness programs educate employees on how to feel better on the job, both mentally and physically. With many workers today spending much of their workday sitting at a computer screen, neck, back and wrist and arm fatigue are major contributors to workplace stress and fatigue. In addition, many employees report eye strain from looking at a screen for so many hours. Twenty-first century corporate fitness programs offer exercises for desk-bound workers and give tips for proper ergonomics to reduce stress and muscle strain when you are on the job. Advice includes everything from simple stretching exercises to scheduled workouts to break up the monotony. According to the February 2011 issue of Harvard Men's Health Watch, exercise has the ability to both exhilarate and to relax and can serve to counter depression and to dissipate stress. Clinical results also have shown that workers sleep better after exercise and are able to lower both their cholesterol and blood pressure levels by following a regular exercise plan. Research is showing that companies who have a corporate fitness program retain their employees longer than other companies. A study conducted by the National Business Group on Health and the Towers Watson organization shows that firms with wellness programs report lower voluntary attrition than do those without them. One example is the Biltmore tourism organization, which reported a decrease in employee turnover rate from 19 percent in 2005 to 9 percent in 2009 after starting an employee wellness program. Employees appreciate the efforts. When Nelnet, a Lincoln, Nebraska-based lending company that handles the administration and repayment of student loans, asks in exit interviews what employees will miss the most, the top answer is Nelnet's wellness program. Camaraderie is harder to measure, but it is also an important a benefit of a workplace fitness program. A greater sense of workplace teamwork is a natural outgrowth of participating in an employee fitness program. Employees who exercise together get to know each other better, and those enhanced relationships translate into all kinds of pluses. Social support is a big component to any exercise or weight loss program, and when your colleagues are in the program with you, you can boost each other's efforts and help hold each other accountable. Workers get to interact with each other in a setting apart from the stress of work and have conversations they may not have had otherwise in the work environment. These relationships help build a company culture of cooperation that can pay off in increased loyalty and in the overall good will that employees feel toward their employer. That atmosphere of teamwork spills over into the community and reflects well on your whole organization. Adopting a healthier lifestyle is ultimately an individual decision. Employers, however, can have a big impact on their employees' lives by creating an atmosphere that shows workers that they are valued and appreciated. A workplace fitness program goes a long way in doing just that. So how can you get started with a corporate fitness program? Maybe you have limited space and limited resources for exercise equipment and you don't know where to start. One way to get your company started on the road to fitness is by becoming a member of Calamity Gym. A mobile fitness platform, Calamity Gym provides members with 24-hour access to fitness professionals and a diverse library of workouts for all ages and abilities, including desk workouts, kettlebell, boot camps, kickboxing, core workouts, dance, yoga and Pilates. Private groups from different parts of your organization can work out together onscreen, and they can even stage a friendly competition against each other for points and prizes. And the workout doesn't have to stay at work. Employees can access their favorite workouts anywhere on their smartphone, tablet, computer or TV. A unique aspect of Calamity Gym is that it donates 25 percent of its profits to charitable organizations throughout the world.